This is my design to listen for Ultrasonic Sounds. Preliminary article Created: "March 6 2009"
Updated "June 27 2011" To Include Either a 40 Khz or a 24 Khz Transducer. The Microphone I used here is a typical 40 Khz Transducer. These 40 Khz Transducers are available from many sources. 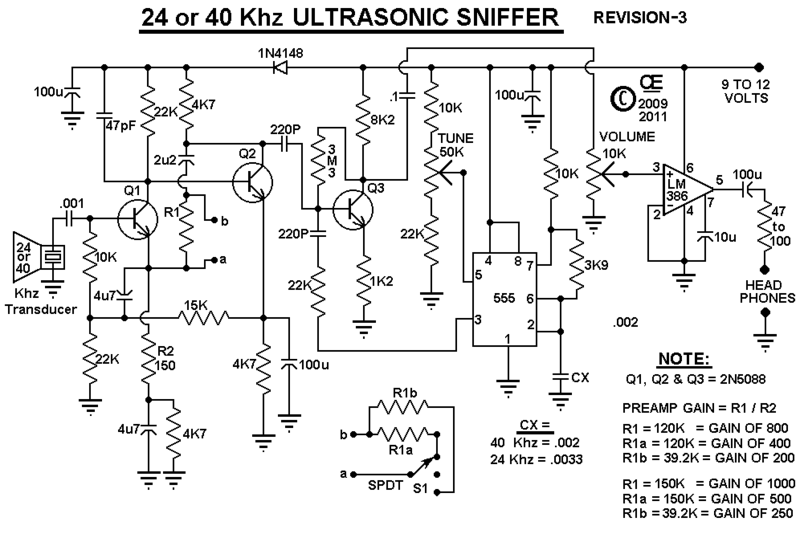 24 Khz Transducer. 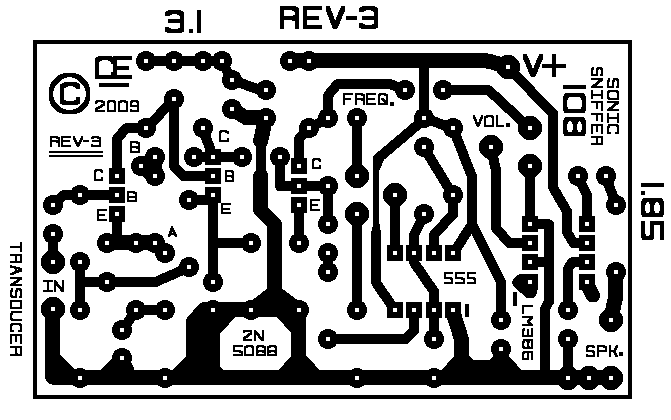 This also works Fairly Good and is now included on the Schematic. But in my opinion, the 40 Khz is Better. My Preamp circuit may look a bit complicated, But its VERY Sensitive and Low Noise. And it is Not Difficult or Expensive to build. 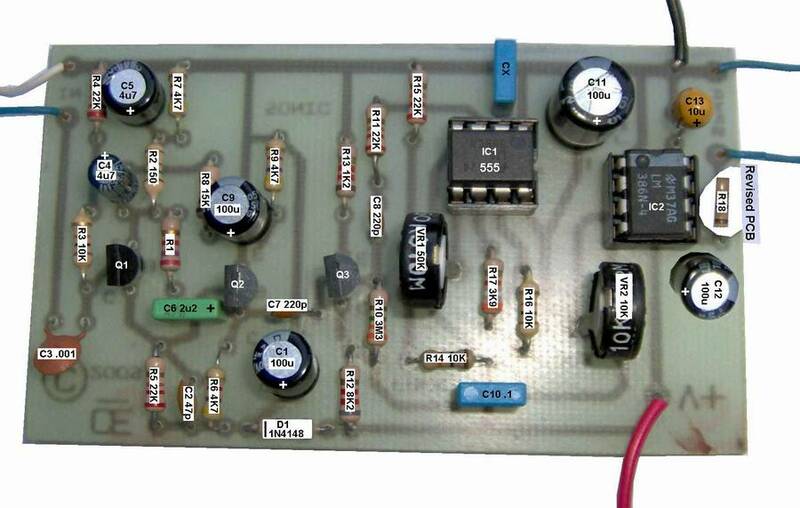 This Revised Schematic allows for Various Preamp Gains of 250, 500 and 1000 Times. Also as Shown on my assembled prototype. At the 1000 times Gain, I was starting to get Interference from Outside Sources. But Much Higher Preamp gains are probably Possible with appropriate shielding. these sounds down to an Audible frequency range that you can hear. In this circuit design, Pin 5 of the 555 is used to make it a Voltage Controlled Oscillator. conjunction with the 40 or 24 Khz Transducer. and also a Greater Amplified Signal over a greater area. "I may give Further Details on this, In the Future". Click here for the Schematic"
Slightly different than the schematic. NOTE: C6 is an Electrolytic Cap, Not a Polyester type as Shown. A Picture of my Assembled Prototype. Very Sensitive at 1000 Gain. another 40 or 24 Khz Transducer on a long cord.